I've got a dog named Goliath who is a "Labradane" (and he's a good 'ol pound rescue - not one of those over-priced hybrids from a breeder mentioned in another post here) - a lab/dane cross. Having never had a pure-bred version of either dog, I'm always trying to figure out which he is more like in appearance and behaviour. I've posted a couple links to pictures of Goliath - so what do you think - more lab or more dane? BTW, he's 27 inches at the shoulder and 84 pounds. He's roughly 2 years old. Judging from photos, I think he looks more like some of the black danes here on this site, though every now and then I find a pic of a lab (almost always a shot of the dog's face looking right at the camera - or artist if it's a painting) that looks like him, but the body is always too chunky. As for behaviour, he loves water, other dogs and children, and he is always trying to sit on my mom and I, and he rears up and puts his paws on my shoulders all the time. I'm so glad this wasn't another thread about designer dogs! His head, mostly his muzzle, looks a little blockier than most labs. The sitting on and paws on shoulders is definitely dane. His size sounds closer to the lab. 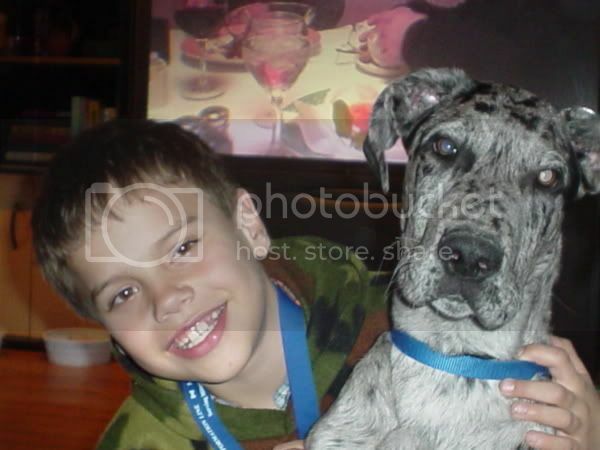 Male danes can be double in weight what yours is and taller (30+"). Good looking dogs! Duds and Miles 5- and 6-year-old fawns, Smudge (terrier mix); Bobke, Fig, Olive, Albert (cats); Einstein (African Grey), Rocky (Amazon Parrot). I have one of each, a yellow lab and brindle dane. He looks more like a lab to me but his legs look like a dane. Are his toes webbed like a lab? Just wondering. He is absolutly adorable! Aside from the dane legs and lips, I think he favors the look of a lab. Handsome boy! Thanks everyone for you compliments on Goliath - I also get a bunch of compliments when I take Goliath out in public too. As for his feet, they look more dane-like to me (short toes and large feet) and aren't webbed. But still - he takes to the water just like a fish! Years ago I had a dog named Frieda that was part Chesapeake Bay Retriever (never did figure out what the other part was - she was red and black brindled unlike a pure-bred Chesapeake and DID have webbed feet and an oily, water-repellant slightly curly coat) and she loved water too.....however Jonah hated it! He was OK with snow, befitting his Alpine ancestry - but no water! What about most Danes - do they like water? Here's a pic of Frieda - if anyone has any ideas about what she might have been mixed with feel free to take a guess! Frieda has the same brindle as my dane! Her face looks like a lab. She's beautiful. Goliath is very handsome. We also have a rescued Labradane named Milo. He will be 2 this month. Milo is all black, stands about 30 inches at the shoulder and weighs in at a level 100 lbs., but I'm told he may "fill out a little more." The mix of the two breeds has produced a wonderful temperment and personality. Milo is VERY smart. Our trainer calls him the thinking dog because he is a determined problem solver. He is a huge couch potato and I say that becuase he feels the furniture is built just to his size. The amazing thing is his mom (a black Lab) had 10 in the litter, 5 male and 5 female and all jet black. I can only hope they have all found such happy homes. It is difficult to tell which breed Goliath favors. 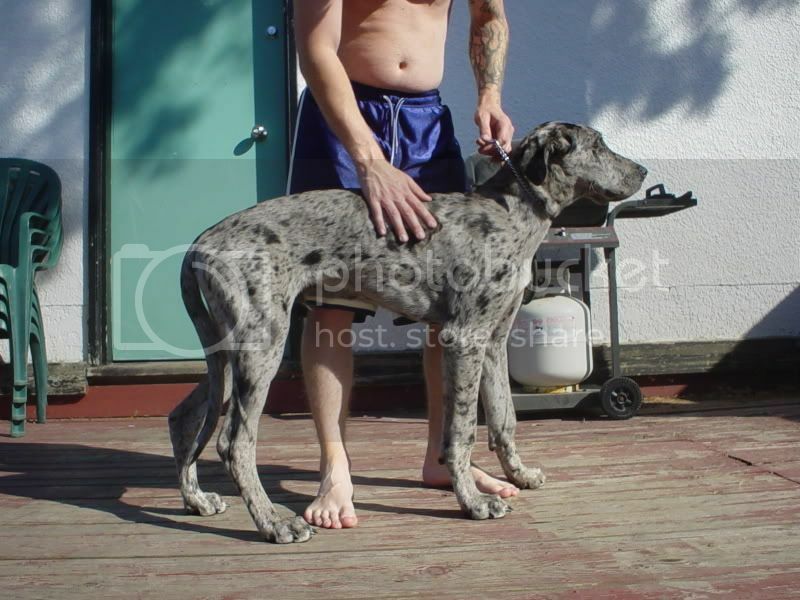 I know Milo definitely has a more Dane-like body. The head of a Dane with natural ears and a Lab can look very similar. I think the mix produces a very handsome dog indeed. Porter is also a mix...they think it was the black lab down the street (his mom was a Dane). But at 5 months he is already 27'' at the shoulders. Porter kinda looks all dane to me, he actually looks more dane than mine. I dont care much about how big he will be or the shape of his nose etc, as long as he is healthy and happy Im happy too!! Awww, thanks, we LOVE her! Really, it doesn't matter what they are as long as we love them and care for them. 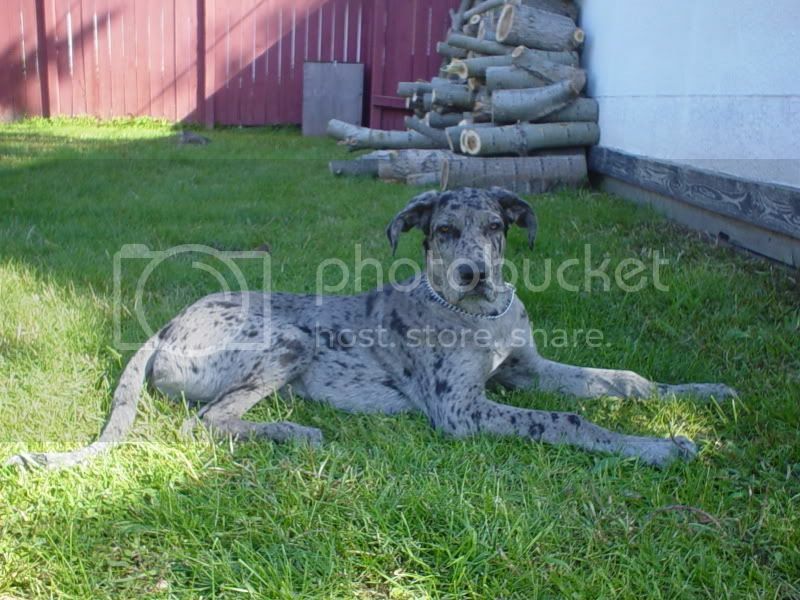 Really all I want is the dane temperment and personality. That's a really wild looking coat Porter has! Vaguely like a coonhound but not quite.....wonder where he got the ears from? Kinda like a greyhound's ears.